The Con Dao Archipelago is one of the most beautiful and least developed destinations in Vietnam. There are beaches, forests, mountains, history, mythology, and a quiet town with crumbling French colonial villas on the seafront. And, it’s only a 45 minute flight from Saigon (Ho Chi Minh City). I can’t understand why more foreign travellers don’t visit, especially the younger, more adventurous ‘backpackers’. I assume it’s the extra airfare and lack of cheap beachfront accommodation that keeps budget travellers away. However, it is possible to enjoy these islands on a shoestring. See below for my advice on visiting Con Dao on a budget, or click here to read my full guide to the Con Dao Islands, or watch my video of the islands here. With the following advice you should be able to stay within a budget of 450-650,000vnđ ($20-$30) a day, per person, including all costs. Don’t travel alone. Some guesthouses have up to 5 beds in a room, and can sleep up to 7 people. These are as close to ‘dormitories’ as you’ll find, so spread the cost of accommodation by traveling in a small group. If you have 3 or more people you could find a room for around 100,000vnđ ($5) or less per person. The same goes for food. Eat meals ‘family-style’ rather than ordering and eating your own separate dish. Dinner is the most expensive meal because, unlike mainland Vietnam, there isn’t much in the way of street food here. Try the new night market for reasonably priced dining, or wander the backstreets until you find a local eatery – one that doesn’t have an English menu. Failing that, if you’re in a group, you can have a great meal at a restaurant like Thanh Huyền, and still keep the price down to around 100,00vnđ ($5) per person. Con Dao Market is a great place for cheap breakfasts, and, while you’re there, you can stock up on supplies for a picnic to take with you for lunch while exploring the island. One ‘extra’ expense which, in my opinion, is absolutely necessary is bike rental. Some of the best beaches are out of town, so you’ll need transport to get there. To save money you can rent a bicycle instead of a motorbike. However – although the distances aren’t great – I would recommend renting a motorbike because you’ll be able to see more of the island. You can still keep the cost down by using a manual motorbike instead of an automatic, and by renting from one of the local guesthouses or Dive, Dive, Dive! instead of the resorts. To further reduce the cost, have two people to each motorbike – one driver, one pillion. Also, if you’re going to use the bike for more than one day, try to negotiate a slightly cheaper rate for ‘long term’ rental. Avoid weekends, if you can, and travel during the week instead. Prices in general on the Con Dao Islands are higher than mainland Vietnam, but on weekends – when domestic tourists arrive from Saigon – they are even higher. The biggest expense of a trip to Con Dao is, of course, the flight from Saigon. $100-$150 for a return ticket makes quite a hole in your budget, and prices are unlikely to come down as there’s no competition between airlines on this route (yet!). However, you can dramatically reduce the cost of getting to the islands if you take the boat. A small vessel leaves Vung Tau (100km southeast of Saigon) several times each week for the 11 hour overnight voyage. Tickets are around $10 one way, but seas can be rough. Perhaps the best option is to take the boat one way and fly the other – this will almost halve the cost of getting there. Note: for more information on any of the accommodations and places to eat listed below, see my full Guide to the Con Dao Islands. This is a list of some of the cheaper places to stay. All but two are in Con Son town. The first few are on the seafront; the others are a couple of blocks back. There are also a couple of camping options. 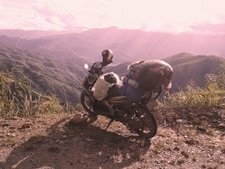 Most places offer motorbike rental for around 120,000vnđ ($5) a day. For a full list of accommodation on Con Dao Islands click here. Con Dao Camping – 700-800,000vnđ ($35); 2 Nguyen Duc Thuan; Check Rates & Availability: [MAP] – Despite the name, this place does not offer camping. Hovering between budget and mid-range, the A-frame bungalows here are good value for double occupancy. This is the only reasonably priced accommodation that’s literally on the beach. Rooms are a bit cramped, but you can’t beat the location. Note: the immediate surroundings might appear a little messy until the construction of the new Con Son pier is completed (scheduled to finish sometime in 2016). 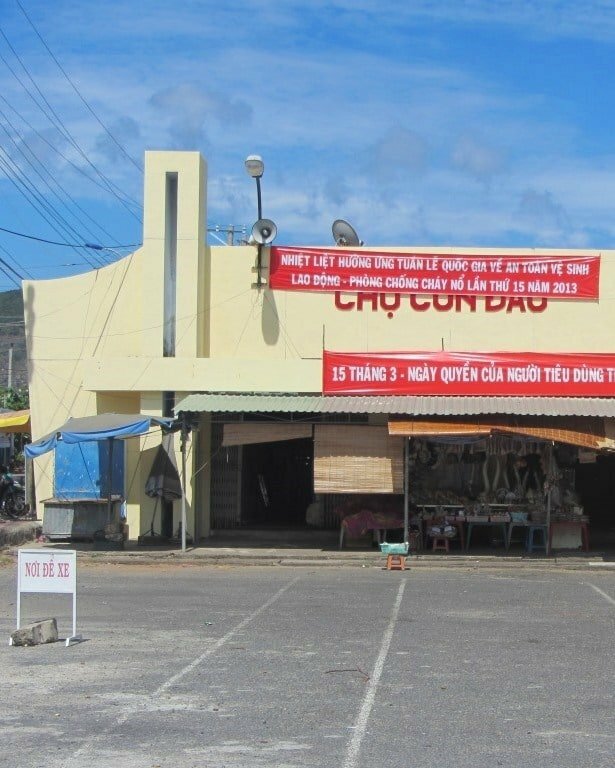 Thien Tan Hotel – 400-700,000vnđ ($20-$35); 8 Nguyen Duc Thuan Street; Check Rates & Availability: [MAP] – This budget hotel is very close to the beach. Rooms are a little musty and old, but still represent pretty good value for double occupancy (considering the hotel’s prime location). There’s a range of rooms (and prices) so have a look at a few before deciding. Next door is the similarly named Thien Tan Star Hotel, which offers better rooms (some with sea views) for $10-$20 more. 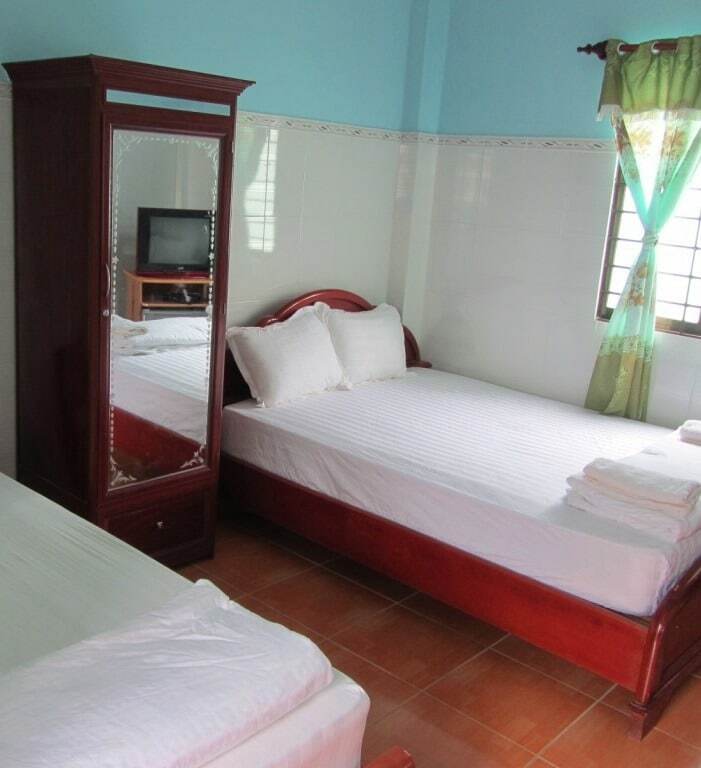 Phi Yen Hotel – 500-700,000vnđ ($25-$35); 34 Ton Duc Thang Street; Check Rates & Availability: [MAP] – This guesthouse was recently renovated, and, as a result, prices are slightly higher than they used to be. But, the clean and comfortable double rooms for 500,000vnđ ($25) are still good value for two people, especially considering its location right on the seafront promenade. 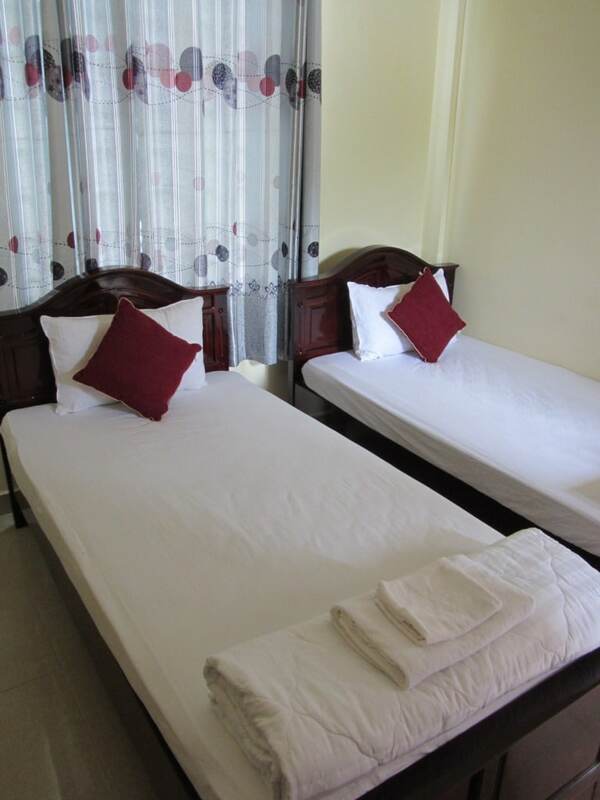 Thanh Xuan Guesthouse – 300-500,000vnđ ($15-$25); 44 Ton Duc Thang Street; Check Rates & Availability: [MAP] – Just a couple of doors down from Phi Yen Hotel, this guesthouse is a clean, no frills budget place to stay on the seafront promenade. With triple occupancy rooms for 500,000vnđ ($25) and discount rates for long stays, it’s well-suited to small groups. However, rooms appeared to be fully booked months in advance on my last visit. There are also a couple more good, cheap, clean, local guesthouses (nhà nghỉ) next door, including Con Son Island Hotel. Hai Nga Mini Hotel – 300-700,000vnđ ($15-$35); 7 Tran Phu Street; Tel: 064 363 0308: [MAP] – This is as close as Con Son gets to dorm accommodation. Rooms here are basic but clean. The larger rooms sleep up to 7 people, so they are good value for a group of budget travellers. Staff are very friendly, and the owner speaks four languages, thanks to time spent in Eastern Europe. Prices work like this: 300-350,000vnđ for single/double occupancy, and 80,000vnđ for each extra bed or person after that. Red Hotel – 350-700,000vnđ ($20-$30); 17 Nguyen An Ninh Street; Check Rates & Availability: [MAP] – Of the handful of mini hotels on this street, this is my pick. Red Hotel has spacious, clean, and colourful rooms. The cheapest (350-450,000vnđ) are great value for double occupancy. The location is right next to the night market and just a couple of blocks from the seafront promenade. Next door are a couple of other good mini hotels, including Hoang Ngoc Hotel. Excellent new mini hotel in the quiet, shady backstreets. Very calm, clean and relaxed. They rent motorbikes too. Anh Dao Hotel – 400-700,000vnđ (20-$30); 22 Tran Phu: Tel: 064 363 0170; Check current Rates & Availability: [MAP] – Next door to Hai Nga Mini Hotel, this place is a very clean, very well-run guesthouse with the kind of spotless rooms you get in these types of places all over Vietnam (albeit for $10, not $30!). 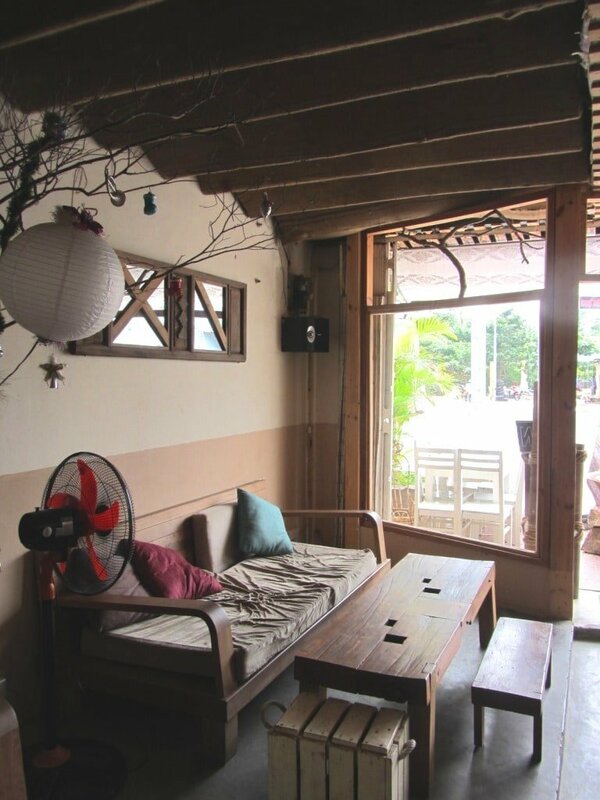 Its location is back from the ocean in the quiet, shady streets, not far from Con Dao Market. If it doesn’t look like it’s very busy, you should be able to negotiate the price down. Nhà Nghỉ Sở Rẩy (So Ray Guesthouse) – 350,000vnđ ($17); Huynh Thuc Khang Street; Tel: 0913 829 373 [MAP] – It’s way out of Con Son town, so you’ll need your own wheels, but the rural location of this guesthouse – in amongst fruit trees and hills – makes it a very different option for a night or two. The guesthouse is in the shadow of the So Ray fruit plantation that was started by the French. The construction of the Ma Thien Lanh Bridge through the jungle to the plantation caused hundreds of prisoners to die. It’s possible to trek up to the plantation from the guesthouse. Rooms are decent but a little musty. The guesthouse is on Huynh Thuc Khang Street – it’s on the right hand side about a kilometre after the intersection of Nguyen Van Linh and Hoang Phi Yen streets. This is thoroughly off the beaten path, and no English is spoken. Other cheap options: on the outer backstreets, behind Con Dao Market, you’ll find more ‘cheapies’. On Le Duan Street [MAP] there’s Quỳnh Anh Hotel and right next door is Tân An Hotel. Also, on Ho Thanh Tong Street [MAP], you’ll find Hai An Hotel and Đăng Khoa Hotel (the latter is run by a lovely older couple who offer free laundry!). National Park Headquarters; www.condaopark.com [MAP] – If you have a tent you should be allowed to pitch it in the gardens here for a small fee. Camping is also now available on Dam Trau Beach [MAP], in the north of the island, near the airport. Làng Đầm Trầu is just to the right as you enter the beach from the dirt road. This new set up is a budget backpacker paradise, with great seafood, comfy sofas and hammocks, and good two-man tents for around 350,000vnd ($6) a night, or pitch your own tent on the sand for around 100,000vnđ ($4). These are some of the cheaper places for a meal. At the restaurants, remember that the more people sharing the meal, the cheaper it will be – most Vietnamese dishes are intended for ‘family-style’ eating anyway. Another great boon for budget travellers are the new water taps dotted around Con Son town, where you can fill your empty plastic bottles with clean drinking water for free. 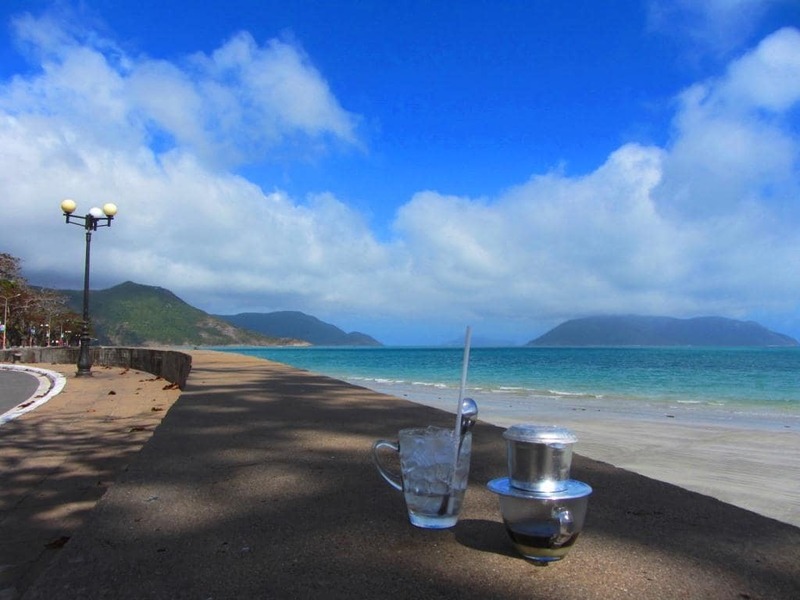 For a full list of places to eat on the Con Dao Islands click here. Con Dao Market – 20-40,000vnđ ($1-$2); corner of Vo Thi Sau and Pham Van Dong streets [MAP] – This recently repainted market hides all sorts of delicious breakfast foods. It’s a great place to fill up in the mornings, especially if you’re on a budget. The earlier you get here the better. The market is also a good place to buy ingredients for a picnic to keep you going during the day while exploring the island. Night Market – 30-100,000vnđ ($2-$5); Intersection of Tran Huy Lieu and Nguyen An Ninh streets [MAP] – Opened just a couple years ago, at the moment there are around a dozen stalls selling food and souvenirs, but perhaps this night market might one day become as popular and lively as the one on Phu Quoc Island. You can find reasonably priced shellfish and beer here, or try one the hotpots (lẩu) which is great value for a group of people. There’s more of a buzz on weekends, but this night market still has a way to go. Watch this space! Quán Ăn Thanh Huyền – 100-200,000vnđ ($5-$10); Khu 3, Hoang Phi Yen Street [MAP] – My favourite place to eat on the island for food and atmosphere, this place is 5 minutes out of town by motorbike, on the left hand side after crossing the lotus lake. Food here is more expensive than most budget places, but with a small group eating ‘family-style’ you should be able to keep the cost down to 100,000vnđ ($5) per person, and it’s great, authentic local fare. Nguyet Hy Restaurant – 50-150,000vnđ ($3-$8); 1 Vo Thi Sau Street [MAP] – This place used to be a superb Saigon-style shellfish restaurant, however it has now changed into a BBQ eatery, specializing in Sichuan-style grills – famous for their spiciness. It was empty each time I passed on my last visit, and I didn’t get a chance to try it, but it might be worth a go, especially if you see other diners there. Infiniti Café – 40-150,000vnđ ($2-$7); corner of Pham Van Dong and Nguyen Van Troi streets [MAP] – This popular cafe (by far the ‘trendiest’ place on the island) serves fruit juices, smoothies, coffee, cocktails and ice cream. It also bakes its own bread (and home-made pizzas!) and offers excellent western-style set breakfasts. Prices are very good value but not budget – the strong cocktails are a great value ‘luxury item’ at 75,000vnđ ($3). This café is also a good place to meet other travellers, especially during the evening. 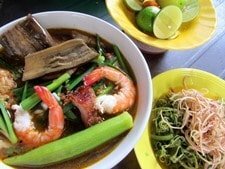 The intersection of Tran Phu and Pham Hung streets has several street stalls selling noodle soups throughout the day which are decent enough and very cheap (see map). And there is also a new soup and hotpot street eatery on Pham Hung Street, just up from the Phi Yen Hotel, near the seafront promenade. Food is good and it brings in a local crowd: serves breakfasts and dinner (see map). Con Son Café – 30-100,000vnđ ($2-5) per drink; Ton Duc Thang Street [MAP] – Well, it’s not exactly budget, but it would be a shame to miss out on this fabulously located cafe. In the middle of the seafront promenade, Con Son Café remains the only place (apart from the resorts) for a sundown cocktail in town by the sea. A few tables are set under big trees in front of the old French customs house, but you can also take your drink over the road and sit on the seafront wall. It’s a superb setting and the cocktails are surprisingly strong. However, as Con Dao has grown in popularity, Con Son Café has started playing loud pop music to entertain its (increasingly young and hip) customers from the bright lights of Saigon. However, on my last visit they had at least closed the 3D mini cinema on the premises – the volume of which was so loud that it drowned out the lapping of the waves and the peace of the promenade. Barring the loud music (mostly on weekends), the cafe is still a stunning place to be. Note that this cafe is sometimes closed for long periods during the winter months when strong winds blow in from the sea (November to February). – Con Dao or Phu Quoc? This entry was posted in ALL, Beaches, Con Dao, DESTINATIONS, Islands, Off Beaten Path, Resources, The South and tagged accommodation, budget, cheap, Con Dao, Con Son, expenses, guide, island, Vietnam. Bookmark the permalink. Your site on Con Dao Islands convinced me to go and see with my own eyes. I am living and working in HCMC for a few months and will be free at the end of the year from Dec. 22 till 31. Would you recommend to visit the island during this season – Christmas and the like? Please take a look at my full Guide to Con Dao – there’s lots more information there about weather, when to go, accommodation, food, drink, things to do etc. And it’s all recently been updated. In general, around Christmas time can be quite windy and the sea can be choppy, but I have still enjoyed visiting in December, although there’s no diving then. I am travelling to Con Dao later this month. Going over via ferry from Tran de, Soc Trang. Same ferry company that goes to Phu Quoc. Will see how this works out and update the post. Is an option as opposed to flying but unless you are planning to go to Can Tho or Soc Trang it is pretty out of the way from HCM. Think cost is around 300,000vnd and takes 2-1/2 hours. Yes, that’s right. I’m also planning to take the boat over from Soc Trang next month. A couple of readers have taken it already and mentioned that it was fine in general, but the crossing can get quite rough. I hope you enjoy it, and any updates are appreciated. Take a look at the hotels in this guide and also in this list. There are a few hotels in that price range for you to choose from. Great information! Wondered if catching a ferry from Bac Liew was possible? Yes, that ferry service started a couple of months ago – the boats leave from Soc Trang (not far from Bac Lieu). Check out the Superdong website for times, prices and additional information. I think it’s the Cat Lo Port on Ba Muoi Thang Tu (30/4) Street, Vung Tau. great site! My boyfriend and I are traveling to Saigon in late June and were wondering whether you would recommend traveling to the island during that time – being in the middle of the rainy season and all… Any thoughts? Been loving this site as i am planning out 5 weeks in Vietnam this spring. 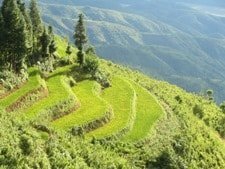 Super interested in checking out Con Dao, but am traveling solo and looking to be budget conscious (any pointers much appreciated). Do you have any other info or ways of finding info on camping at Dam Trau- this sounds perfect. Also do I need a Vietnamese license to drive a motorbike there? Well, I’ve tried to lay out as best I can in the guide on this page how to visit Con Dao and stay within a budget. I don’t have anymore information on the Dam Trau camping yet, but I don’t think you’ll have a problem if you want to stay there. I’ll try to get back to Con Dao within the next couple of months to update this guide. You are very unlikely be asked for a driving license in order to ride a motorbike on the island. Hi Tom and Joe, I was out at Dam Trau beach today and camping on the beach is listed on the menu of the beach restaurant furtherest right as you approach. Sweet beach and 350000 VND for supply of tent, camping there would be pretty nice. Also, i came over on the new Superdong ferry service from Soc Trang. It wasnt the smoothest of trips. Thanks for the information – good to know about the camping. Great article! Really looking forward to foing there. I am planning a big trip around vietnam on a bike (going to buy one in Hanoi) going all the way down to Saigon. I have plenty of time available so i wanted to check everything. 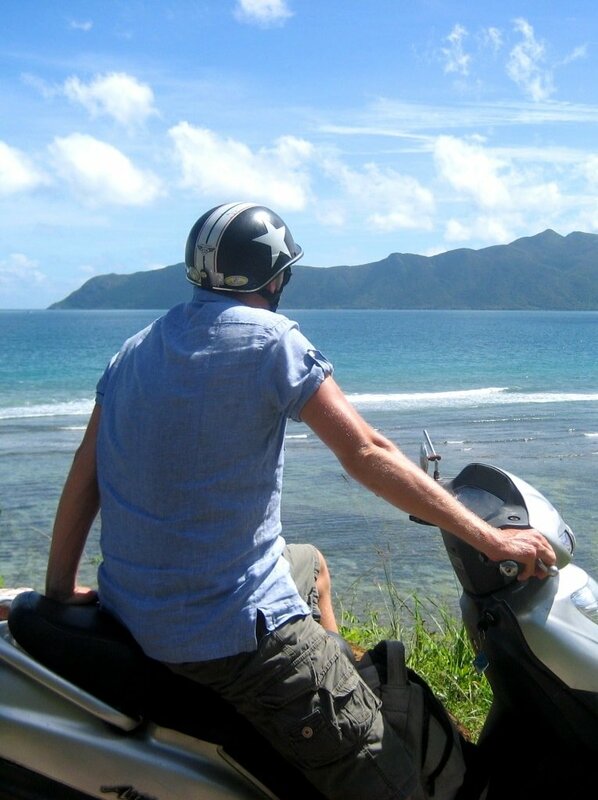 One question: is it possible to get to Con Dao islands with my motorbike on a boat? 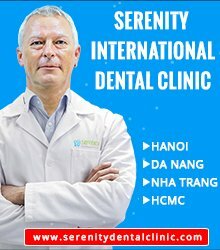 I am visiting Vietnam in October and November. With the current situation of water pollution and dead fishes, I am wondering if Con Dao beaches are safe to swim and seafood are safe to eat. Apparently, local travel agents buy up all the air tickets to Con Dao and try to resell them at a mark up. The ones that can’t be sold are only released the day before the flight. Tom, is this true? I’ve been trying to book a flight to Con Dao from HCMC online on Friday the 12th of February. Acording to the VASCO website the the flight is sold out. But I can’t tell whether it is genuinely sold out, there are simply no flights that day or whether it is the scam in operation. If it’s either of the first two options then I’ll simply book a flight on Thursday the 11th or Saturday the 13th. I’ve never had problems getting tickets through the Vietnam Airlines website. They are usually around $150 return. But weekends are busy because many Saigonese head over there – so sometimes they can be booked out. You should try contacting Larry from Dive, Dive, Dive – he knows all about the scams and should be able to help you get tickets. I will be visiting Vietnam at the end of February 2017. I also was just checking what I can book on Vietnam airlines and it appears as no tickets are available for the dates I chose. I originally selected Feb 20-22 and then again for 24-26 (just to see) and nothing is available. I’m wondering if what Ricardo said about the scams is true. Brooke, were you able book tickets at the end of it all? 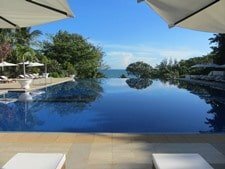 Yes, there definitely are some issues with booking flights to Con Dao – it sounds are though they are hoarded by agents and then sold at high price, or something along those lines. Strangely, though, I have never personally had a problem finding and buying flights to Con Dao through the Vietnam Airlines website. However, there may be a way for you to get your flights: a friend of mine on the islands, Larry from Dive, Dive, Dive, suggests contacting Ms Van at [email protected] I’m reliably informed that she can get flights when no one else can. Please let me know if this turns out to be successful. I will be traveling around Vietnam in December and January. After I travel Vietnam from Hanoi to Ho Chi Minh, I am looking for a beach to relax for a week. I have done some research, but not finding what I am looking for. So here is my question, where is a beach to relax on during the day but have some options for a girl traveling solo to meet up with other travelers? I don’t want an overcrowded tourist destination. I don’t want to be surrounded by families only. I want a place that has some “touristy” things to do. I want a place that has some nightlife so that I am not alone the entire week. Other options inlcude Nha Trang and Mui Ne – but Nha Trang’s weather isn’t great at that time of year, and Mui Ne has lost some of its charm in recent years. Thanks Tom for helping me to decide. Would you recommend Long Beach on Phu Quoc? Yes, Long Beach should be fine. It’s quiet in the day, and lively (in certain places) at night. There’s a large backpacker-type crowd there throughout the year, so lots of chances to meet other travellers. Thank you for this very interesting post! We are planning to visit Con Dao island this April, and we wanted to know a bit more about the travelling by boat. Do you know which day of the week the boats leave ? Or where we can get the information ? Pretty much the perfect post for budget travel tips for Con Dao. Thank you. I shall immediately check whether my flight from Phu Quoc arrives early enough to catch the Con Dao one, got a bad feeling it won’t, so a lot of quick thinking to do. West coast of Phu Quoc has jellyfish, so we are going to check out the south east coat tomorrow instead. Damn, flight is too late. Sand is not very white here, will see what it is like to tomorrow in south then decide. Might just stick to original plan of waiting in the airport till two am then flying to the Philippines where I know some white sand beaches. The whitest sand beach on Phu Quoc Island is Sao Beach in the south-east. But get there early because it can get busy during the day, especially at this time of year because of the Lunar New Year holidays. Dai beach and Vung Bau beach are also very nice in the north-west – not white sand though. The north-west coast should be OK – the jellyfish are usually around Ham Ninh where the ferries dock. Flights might be fully booked at this time of year because of the Lunar New Year holidays. I live in Saigon and I would like to drive from here to Vung Tau, put myself and my motorbike on a boat, then head to Con Dao and drive using my Honda there. Do you know if the boat Vung Tau/Con Dao allow motorbikes onboard or only people? It would be a nice independent trip. By the way, thanks for your amazing work. Your website is a real gem and provided me with essential information when I did the drive Saigon/Hanoi last November. Thanks. Yes, the boat from Vung Tau to Con Dao does allow motorbikes on board. You’ll have to pay extra for it. They strap it (pretty securely) on the deck. It’s probably best to arrive early at the pier in order to make sure that your bike gets on board – there’s only a limited amount of space for bikes. Although I agree with you that this is a nice independent trip, there are plenty of motorbikes available for rent on the island, and the boat journey can be crowded and rather unpleasant due to passengers constant seasickness. However, arriving in Ben Dam harbour at dawn sure is a romantic introduction to the islands. Love the Con Dao islands! Looking forward to going back this year for the Turtle season! I might get in touch with Larry, in order to check how to get the cheapest fare 😀 Definitely the best island I have been to. I’m glad you like the islands as much as I do. I’ve never seen the turtle nesting, but I’m sure Larry’s the man to contact about it. I hope you get back there soon. Just want to say I’ve loved reading this post about the Con Dao Islands – it’s so informative and is really going to help me plan my trip for December 2015. It’s a long way away but I love doing all the research! I’m really hoping that the weather will be nice at that time. I know that the waters are clearer during the raining season, but hopefully we can still go scuba diving and biking on the island in December? Thanks. Yes, the islands as always nice: it’s a very special place. December can be a little windy and the seas may be a little rough. Biking will certainly be OK. Diving will depend on the weather conditions. I suggest you contact Larry at Dive, Dive, Dive! before your trip – his diving operation is highly recommended and he’s also a great source of all other information about the islands – including how to get the cheapest airfares. I hope you enjoy the Con Dao as much as I do. 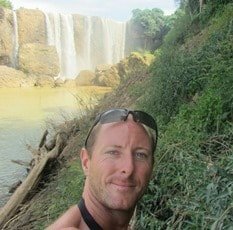 I have never read a blog with so much details about Vietnam like yours. All the places you have visited are the most scenic places that Vietnam can offer. Even as a Vietnamese, I haven’t visited all of them yet. Such a wonderful travelogue!